The trails at Islet Lake are for “glam” hikers. However, no one seemed to mind having the opportunity to walk three or four abreast and use an outhouse every few kilometres! 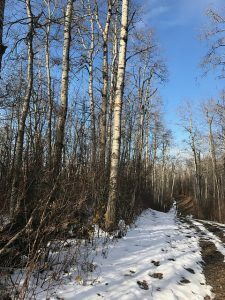 The trails we hiked this Sunday are part of the 170 km of regularly maintained multi-use trails in the Cooking Lake-Blackfoot Provincial Recreation Area. Our welcoming committee, as we naturally understood, was the swans and ducks gathered in an icy pond just before the Islet Staging Area. When Jerry and the carpools finally arrived at the staging area, the fifteen of us were ready for take off. There was still some snow and ice on the trail which turned into mud by the end of the hike. Along the way Marco was startled by a beaver that slapped its tail hard on the water in one of they many ponds. Ducks and muskrats shared the ponds with beaver and along the trail we scared up a ruffed grouse. Everyone noticed many squirrels very busy racing erratically in every direction and heard the rather eerie, low, garbled croak of ravens overhead. The highlight for many of us, however, was a timely flock of graceful white swans that flew over us as were enjoying our lunch at the Lost Lake Shelter. 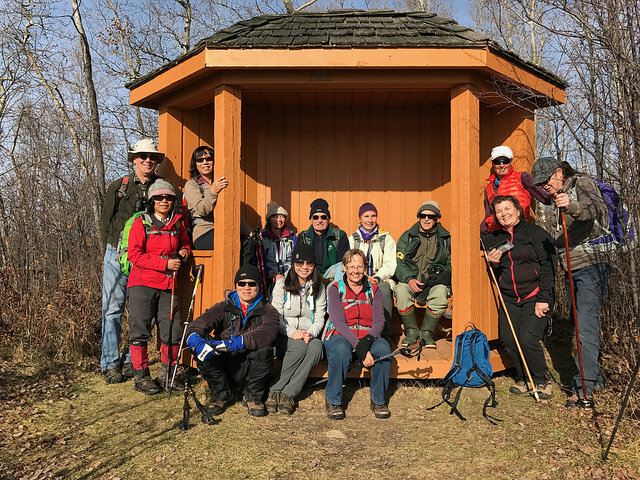 Nature and its generous splendour is always a highlight of our hikes, but the other great part of the WTA are the fellow hikers. How refreshing it is to be with people who choose to get off the pavement; like-minded nature lovers, who do not seem to be concerned about acquisitions, name-dropping, one-upmanship or—dare I say it—fashion. Every hike is an invigorating reminder of how the simple things like great friends and the great outdoors can truly bring us the greatest fulfilment. 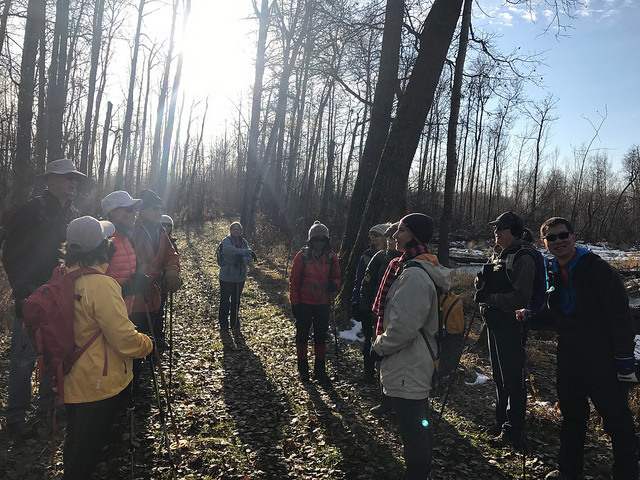 Upon reflection, a hike with the WTA is always time well spent!